Hello Everyone! Welcome to the Teacher Appreciation Blog Hop! It is that time of year that we are saying "thank you" to all those wonderful teachers that touch our lives and help mold the minds of our little ones! I am so excited to be a part of Jen's hop today! If you are coming from Lisa's Crop & Create then you are heading in the right direction. If you just happen to be stopping by today and want to hop along, you'll want to start at Jen's blog, Jen's Craft Corner! You don't want to miss out on the wonderful ideas and the fabulous blog candy! Here are my Teacher Appreciation projects! I made a very special little chalkboard bag for a very special teacher! Here is a view of the dimension! I folded a strip of paper to make a ledge for the chalkboard. Then I added a rolled piece of paper for the chalk and used different brands of pop dots on the book and the bookworm. The bookworm was cut from Create A Critter and I added a Peachy Keen Critter Face. For the lens on the glasses, I used a dot of Crystal Effects. I love how they turned out! I added Cherry Red Baker's Twine from My Craft Spot as an accent to the bag! I made a set of simple note cards to fill the bag! I left them blank so the teacher can use them for anything! My second project are quick little items for the support teachers and helpers. They are post-it note books made using the same little bookworm and a cute background paper! Here is the side view of the post-it note books! and last but certainly not the least, I made these little cards for my kiddos Sunday School and Awana teachers. They are all volunteers and they do it for the love of the Lord and for the love of the children! I just had to make a special thank you for them so they know they are appreciated too! Now are you ready for some BLOG CANDY!! This is my first Blog Hop so I wanted to make it special. The first item I am giving away is a set of my most favorite embellishment...Hand Dyed Crinkle Ribbon from My Craft Spot!! One lucky winner will get their choice color set! If you haven't seen all the gorgeous colors available you must check them out at My Craft Spot!! 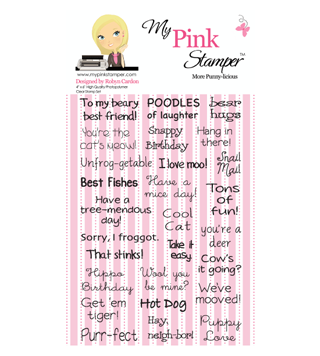 The second item I am giving away is a More Punny-licious stamp set from My Pink Stamper! In order to enter the drawings you must leave a comment below and tell me about a special teacher in your life! You do not have to be a follower but I would love if you were! I truly appreciate all of my followers so if you are a follower, you can add a second comment for a second chance to win!! Easy enough! I will pick the two lucky winners on Monday May 9! Now hop on over to my very talented friend Rae at Wahoo Crafts for her creative Teacher Appreciation project! I have listed the Hop line-up below just in case you get lost along the way! Thanks for stopping by and hopping with me today!! I hope you'll stop by again! Your card sets are adorable. Any teacher would love to have those. My favorite teacher was Mr. Larson, he was my 4th grade teacher and my 6th grade teacher. He was the best teacher ever. He would teach us math while passing/tossing a rubber ball around the room. It kept us all paying attention and having fun while learning at the same time. He would also go out at recess time and actually play kickball with us. Great teacher. OMG! You are so talented! Where do you find the time to create such incredibly professional looking (but still adorable) projects? I'm just loving them. I'm a new follower btw. :0) I have no kids and have been out of school for quite some time so I, sadly, don't have a teacher of any sort in my life at all. :( But, I can learn a lot from your blog, I'm sure! Thanks for sharing and for the chance to win! I cannot tell which project is my favorite. WOW!!! I love it all I wish I was a teacher and had a parent like you to get these cute cards from. I remember my preschool and kindergarten teacher Sister Girarda. She was the BEST! Every once in a while I still run into her randomly at the supermarket and it brings me back when I was a little girl again. She was the sweetest most caring teacher ever. Amber you are soo incredibly talented. I ♥ to see your work. These are ALL magnificent projects. I would want to have them ALL as a teacher. Someone is going to be super lucky. P.S Be sure to enter my giveaway. My favourite teacher was my grade 4 teacher Mrs. Oickle. I remember her reading us the book Island of the Blue Dolphins and that began my true love of reading! We also got to raise salmon in her class and release them into the wild. She was such a cool teacher! Thanks for the awesome giveaways I am also a long time follower! Thank you so much for joining me! I love everything you made for today. They are all wonderful! You are very talented. As a teacher, I would love to receive your handmade gifts! What a special gift that would be! I am a teacher and the reason I became a teacher was because I had a special 8th grade teacher who loved his job and loved his students. I remember him and think of him often. Teachers are certainly very special people. Your sets are TOO cute! WOW! My favorite teacher was Sister Mary Theresa. She made learning fun. These are all such great gifts. The worm is so dang cute. I still think of my favorite teacher often...He was one of my algebra teachers, and was just the greatest...very helpful, very kind, but also very strict. Wow! You have been incredibly busy! What super, super projects!! I love the little chalkboard creations. That little bookworm is adorable - especially with his glasses!! Great job with the Sunday School cards as well. They are adorable and the sentiment is just perfect with the cards. Growing up, we had a church behind our house and I went there on Tuesday evenings - for Awana!! I have incredibly fond memories of my teacher. I still remember a number of the verses that I learned, too! It's amazing what an impact an organization like that can have on children. Thanks for recognizing and appreciating the volunteers. You did it again!!!!!! What a lovely projects... you are a genius!!! I love all your projects and the worm glasses are just the cutest...Love that worm with his little sweet face and the glasses... love it!!! My favorite teacher ever is my primary school English teacher. Take into account that she is the one who teach me my first english skills so I am here writing to you ion english in some way, because of her... My primary school classmates and I still meet together every now and then (after 25 years) and she is always(or almost always) part of the group! These projects are all so awesome. OMgoodness! I love your projects all of them. I have a very special teacher that is in my child's life. She is his special ed teacher. He has a mild case of autism and she does a wonderful job! I just LOVE,LOVE everything! That is the cutest worm I've ever seen! You out-did yourself with these! All of your projects are fantastic. My girls saw the little worm and want to go make something with it now. A special teacher in my life was Mrs. Oathoudt, fantistic Homeroom Teacher. Thanks again for sharing! I am a follower of yours already! Thanks for a chance at your giveaway! I'm already a follower! My favorite teacher was my third grade teacher, Mrs. Green. She always went out of her way to let each child know she cared about them. She's the reason I decided to become a teacher. I aspire to create such a positive impact on all of my students lives just like she always did! I have had many great teachers in my life and am now a teacher myself! Not here to win - just had to tell you how absolutely adorable this project is!! What awesome projects - I am very impressed with them! New follower and my fav teacher was 5th grade, Mrs. Ballard - she was a die-hard Beatles fan, taught us their songs and had us give a concert! Wow Amber....your creations are awesome! Any teacher would love to receive these cards and gifts. I love the book worm and how you did his glasses....very cool! WOW... ALL of your projects are so super cute! It has been fun joining you on the blog hop. I think the teacher that had the biggest impact on my life was my communication professor/advisor in college... Professor Dillman. He really taught me how to think. Thanks for taking me down memory lane... and an opportunity for some great giveaways! LOL! Love all your projects. Absolutely all adorable. Love th worm and his very cute glasses. OMG..All of these came out so great! What great ideas! Love everything! Great projects! I have great memories of my 2nd grade teacher, being very encouraging! He really made a difference in how I felt about learning! Wow what awesome projects. So many wonderful details. Great job. My memory of my favorite teacher would be how she made me feel so loved. She would take me with her when she home schooled. She just made me feel like I was hers. These are ADORABLE!! I especially love the post-it notes holders! So cute!! Nice and great giveaway! I had a fun kindergarten teacher who I loved! I love your projects!! Love the blackbords & the book worms, they are so cute!! I was very lucky - my mom was a kindergarten teacher. I think she gave my the love of learning and that made school so much easier and enjoyable for me. I had so many wonderful teachers in my life :) Thank you one and all. I was just thinking about what to give to my son's teacher at the end of the year, along with her gift card. She always sends thank you's so this would be GREAT. THANKS for the inspiration!